This is the photo of a 30-year-old white male with a one-year history of a small non-healing ulcer on the dorsal aspect of his right great toe. He was followed for a year at another wound center in my city, using a variety of topical products. I follow the “wounds don’t not heal for no reason” principle of patient assessment, so I performed vascular screening with TCOM and the value on the dorsal foot was 4mmHg (normal is 50mmHg with somewhere between 30 and 40mmHg needed for healing). I thought there must be a mistake. I used my Vasamed device to check his skin perfusion pressure which was 38mmHg. 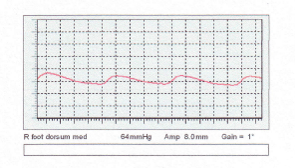 However, his pulse volume recording was nearly flat rather than having a nice triphasic wave form. To make a long story short, he had only one large vessel below the knee that was open and his disease was so bad he was not a candidate for angioplasty but instead required by-pass surgery. His slightly better skin perfusion pressure was likely due to collateral vessels keeping the capillary perfusion up a bit (he was still walking at work but admitted on careful questioning to claudication). And by the way, it turns out he had osteomyelitis of the great toe as well since his wound had been open for a year. It really worries me when a wound center can follow a patient for a year and not evaluate either the vasculature or the status of infection. You should be able to explain why every patient in your clinic has failed to heal. Every patient with a non-healing lower extremity wound needs to be assessed for tissue hypoxia. TCOM and skin perfusion pressure don’t measure quite the same thing. One measures tissue oxygen levels and the other the capillary opening pressure. However, either one can tell you if the patient likely has vascular disease. This is NOT a normal PVR for a 30-year-old man.